An environmentally-friendly and highly-efficient solids handling pump provided the ideal solution when Selwood was contacted by Bridges Electrical for assistance with a complex operation. Wessex Water contracted Bridges Electrical to carry out upgrades at Westover pumping station, near Langport, in Somerset. The upgrade work included replacing pumps, fitting new stools, replacing control valves and concrete repairs to the base of the wet well at the pumping station, which is strategically important and is in an environmentally-sensitive location on the edge of the River Parrett. The challenges were several-fold. Temporary overpumping was required to deal with all incoming flows from the surrounding area and deliver through a 500m existing underground rising main through to Langport sewage treatment works. Overpumping had to be capable of providing up to 70 litres/sec at 27m total generated head – a challenging task indeed. Further issues to overcome were lack of space available within the perimeter of a very small pumping station. There was not enough space to place a traditional end suction diesel pump and access to the manhole was so small that a traditional electric submersible pump was out of the question. Given the station’s sensitive location, a pumping solution using electric rather than diesel drive was highly desirable. The experience and knowledge of Selwood’s pump rental specialists came to the fore when a site survey was carried out, including discussing the various options with the client. 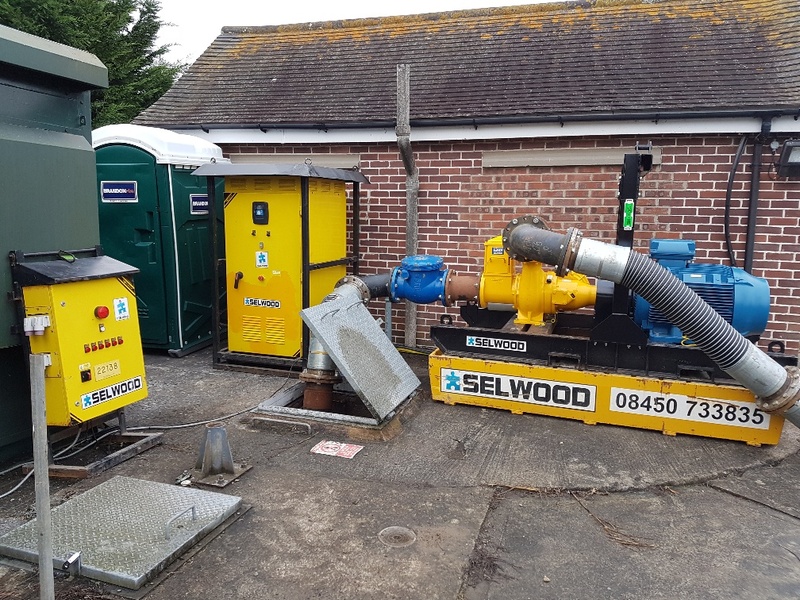 Selwood was able to provide a bespoke solution by supplying one of the new S200 electric drive pumps – a model that was able to match the incoming flow and rising main head requirements for the operation. The S200 is part of the market-leading solids handling S range that are renowned for their trouble-free pumping of raw or screened sewage, sludge or slurry, water with fine and large solids, and water containing rags and fibres. The S200 features a capacity of 560m3/h, a total head of 23m and can transfer solids sizes of up to 100mm. Due to the confines of the site, standard 8-inch wire armour hoses were deemed to be too long and did not provide enough flexibility. Eight-inch flanged composite hose, supplied in shorter 5ft lengths and significantly more flexible that wire armour hose, proved to be the optimal solution. Selwood also provided a 200kw inverter control panel with ultrasonic control panel and transducer. Installed and programmed by Selwood’s own electricians to the requirements of the client, it provided ease of use throughout the application. Phil Ingleheart, Framework Manager for Selwood, said: “Our solution meant that the customer benefitted from an environmentally-friendly auto prime electric pumping regime, saving the cost of running diesel driven equipment. “In addition, this was a friendlier solution to the local environment by eliminating the risks of diesel fuel spills near the river. Fin McDermott, Senior Project Manager for Bridges Electrical, said: “Selwood’s response time to the enquiry should be commended. “Phil Ingleheart was made aware of the criticality of the works and attended a site meeting to review the requirements without delay. “While on site scoping the requirements, safety was at the forefront of Selwood’s surveying process and their specialists completed a site-based risk assessment to ensure access, lifting, and security were considered with each step. Fin added: “While on site Bridges and Selwood worked in partnership to install and commission the overpumping system. “This collaboration speeded up the installation time and prevented delays with refurbishment of the wet well. “Thoughout the rental period, Selwood maintained regular communication to ensure correct performance of their equipment being rented. For more information on the S range click here.